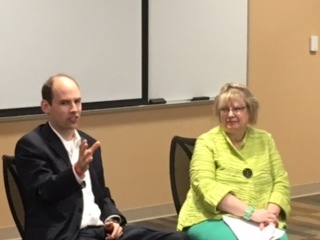 On April 19, Assistant Professor in the Jack C. Massey College of Business Dr. Haskell Murray participated in a convocation event regarding his most recently authored academic articles. The articles and discussion centered on the topics of stakeholder advisory boards and the social enterprise market. Murray teaches business law and negotiation courses to both graduate and undergraduate students. His research currently focuses on corporate governance, mergers and acquisitions, sports law and social entrepreneurship law issues. His articles have been published in a variety of academic journals including the Harvard Business Law Review and the Maryland Law Review. Murray also serves as the co-editor of the Business Law Professor Blog and is on the executive committee of the Southeastern Academy of Legal Studies in Business (SEALSB). He clerked on the Delaware Court of Chancery and practiced corporate law at global law firms King & Spalding in Atlanta, Georgia and Weil, Gotshal & Manges in New York City before joining Belmont’s faculty.